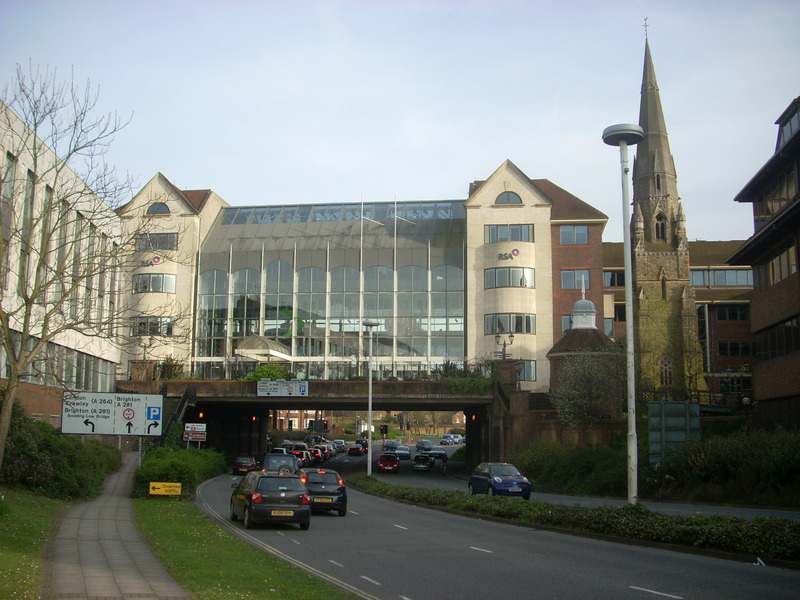 Way back in the 1970s, Horsham built a stub of inner ring-road, a dual carriageway that was later extended in two stages to (almost) encircle the town centre. It’s called Albion Way. and blasting a dual carriageway through a high street, to link up with a new Sainsbury’s, built on school playing fields (you can see the car park by the ‘A’ on the map above). Frankly, it’s a bit of a monstrosity – overkill, given that it duplicates a bypass that encircles the town. The severance is crap for people walking and cycling, who only have a few places they can cross it, which are (with one exception) pretty awful. Motor traffic on Albion has consistently fallen over the last decade, and it needs to be resolved. But even in its current form it represents a bit of a mixed blessing. The town planners who initially set about building it were quite clear that motor traffic should be removed and displaced from the town centre – and that has been achieved, pretty well. The area enclosed by the ring road has only one route through it, as shown below. This is a one-way road – all the other streets in the town centre have been pedestrianised, or are dead-ends, or do not form useful routes to anywhere, and are only used for access. 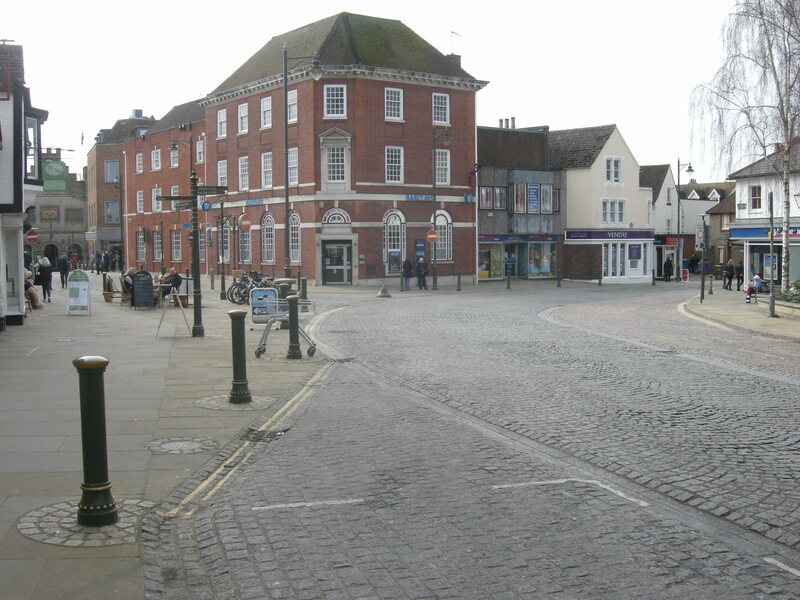 And the centre of Horsham as a whole was one of the first 20mph zones in Britain, dating back to 1992. As well shall see, the only route through the centre has traffic calming in the form of humps and a cobbled surface, and is deliberately tortuous, in an attempt to discourage people from using it as a through route, rather than the longer ring road (although in my experience many people still try). It’s pretty good, and I have sung the praises of the town centre before, which has been improved further over the last few years by the progressive removal of motor traffic from more streets. The only problem… is that cycling has been forgotten about. The town centre is impenetrable from most directions by bike, because of the one-way route through it (that doesn’t have an exemption), and pedestrianisation. There is no useful, direct route across the town from north to south, nor from east to west, nor from west to east. The only route through the town centre is by following the existing one-way street. This lack of permeability is really quite poor. This may change. West Sussex County Council won some Local Sustainable Transport Fund (LSTF) cash in the last round of bidding, which has to be spent by April 2015 – some of that cash is coming to Horsham, to construct (amongst other things) a cycling route across the town, from the station (which lies to the north of the town centre) through to the south. This will obviously have to tackle the one-way system. The planned route will come from the station, over the inner ring road on an existing shared walking and cycling route (running along the bridge in the picture earlier in this post). 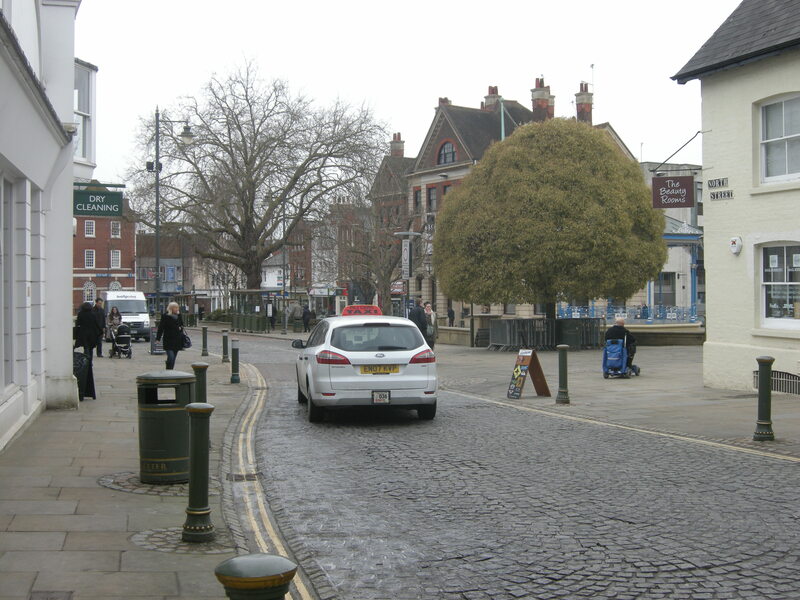 It then arrives in the Carfax, where it is confronted by the one-way road in the centre of the town. The route will have to run from where the photograph is taken, to the red brick building in the distance. There is a huge amount of space available here, but there probably isn’t going to be much money to play with. That means relaying the street (playing with the cobbles!) to make the carriageway wider is unlikely. My instinct tells me a simple contraflow would be the most straightforward (and cheapest!) approach – simply legalising cycling in a contraflow direction. But there are issues. 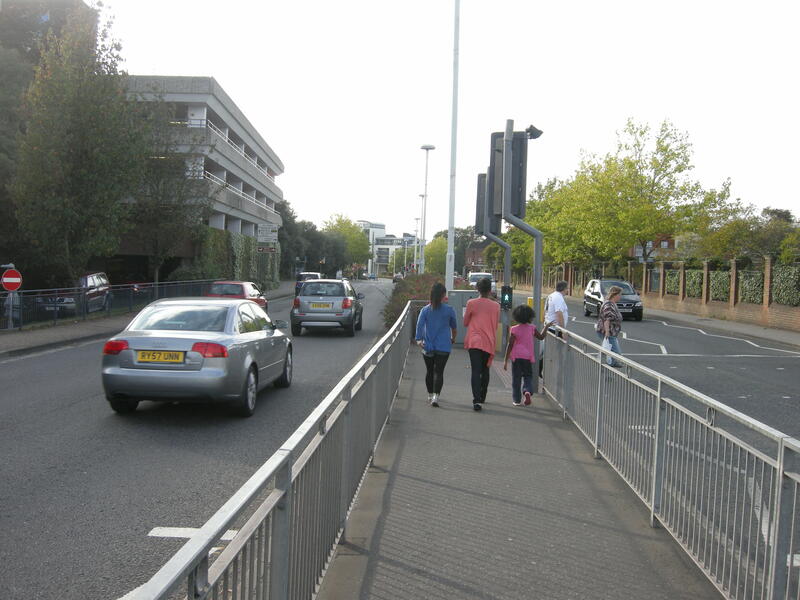 The carriageway is not especially wide, and while the volume of traffic is not very high, at all, there are potential conflicts with a loading bay on one side, and a combined bus stop/loading bay on the other. This picture gives some idea of the potential difficulties. The other alternative is to route the contraflow to the left (as we look at it) of that loading bay, but this is not particularly wide, and would obviously impinge upon walking. It’s probably a non-starter. I’ve taken a short video of this section of road, at one of the busiest times of day, 5:30pm. This is when the density of people driving through the town centre tends to be highest – to pick up friends or relatives at the end of the day, to grab some cash from the banks nearby, or simply to use it as a shortcut. This is obviously combined with the buses – the frequency is not especially high, but it could be a problem. See what you think – it gives a flavour of how difficult it could be to cycle in a contraflow direction, and also how easy it could be! Outside of the morning and evening, I think a straightforward contraflow could work absolutely fine. The street is very quiet. Indeed, in the evening, and the middle of the day, it can be absolutely deserted. It’s also a low speed environment, with pretty good (by British standards) traffic calming. But it could obviously present difficulties at peak times. The street is awkwardly designed, as far as two-way cycling is concerned – the narrow bits are in precisely the wrong place. Optimistically, if it is made obvious that there will be people cycling in a contraflow direction to people driving through the centre, my hope is that people will exercise common sense and not crash into each other. The advantage of this approach is that will cost next to nothing, beyond signage. If, as I fear, it’s not good enough, and people simply can’t behave, then it will have to be changed. My ideal solution would simply involve cutting out much more of the motor traffic – stopping the use of the Carfax as a route, by installing a bus gate halfway through it. Buses could still pass through (this is an important bus stop, right in the centre), but private motor traffic could not. The roads would be returned to two-way, for all vehicles. 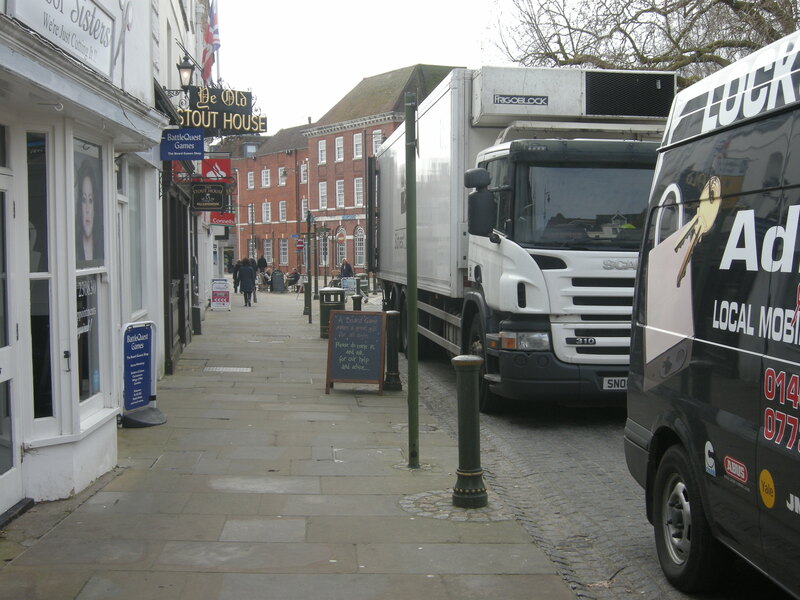 This would stop people driving through, but would still allow access for people loading and delivering, and to the disabled parking bays in the town centre. Indeed, we have already had an (accidental!) 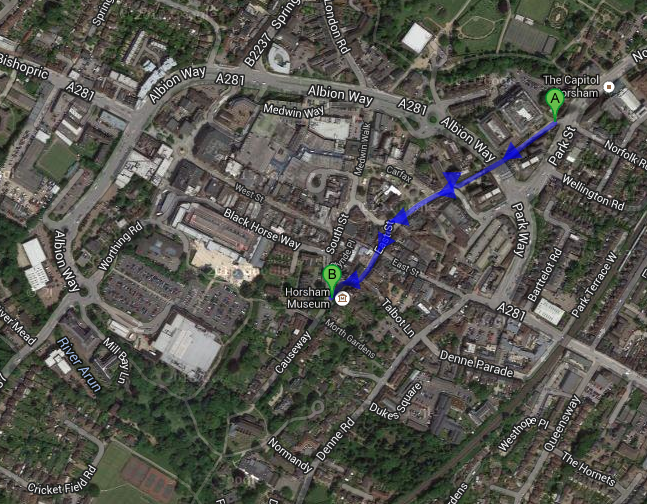 trial of this system last year, when the humps in the Carfax were being repaired, and the route was blocked. This closure point here would be the natural position for the bus gate. While these repairs were taking place (for over a month) people could still access all parts of the town centre, but couldn’t drive through. I even have a picture of a taxi driving the ‘wrong’ way down the section of road that will need two-way cycling! Legal two-way driving on this narrow section of road, during the repair works. This could be the way forward. This would be the ideal solution, but it would represent a bigger change, all for a mode a of transport that people around here don’t really think exists. It would be a much harder sell. The contraflow would be easier to implement, but sub-optimal. I’m wondering what you think. 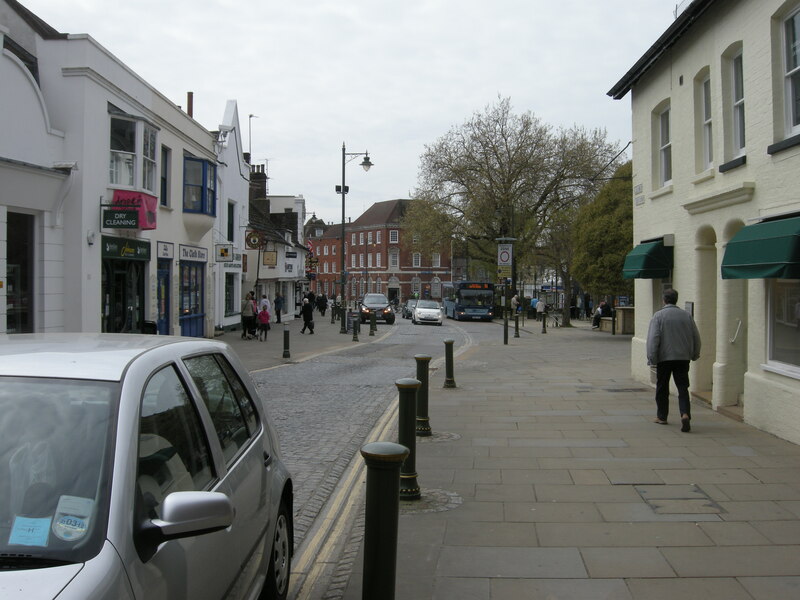 This entry was posted in Horsham, Infrastructure, One-way streets, Pedestrianisation, Permeability, Street closures, West Sussex County Council. Bookmark the permalink. Surely this would be an easy sell for pedestrians and shopkeepers too, by making the street a more pleasant environment with less traffic. Given that there’s a ring road, I can’t see any issues that outweigh the benefits.. I think your bus-gate idea would be the best solution, so long as there was sufficient warning and there was a natural “escape route” (I’m guessing you don’t really want people reversing back up the street if they chance upon the gate in error). The gate also has the advantage that there are many precedents for this sort of treatment all over Britain. I suspect It would also seem a lot more natural and “fair” to non-cycling people than a contraflow; a somewhat counter-intuitive concept to people with no direct experience. As you say, the difficulty is convincing people that this is a good idea in the first place. Yes, people moan and complain about changes to routes immediately prior to when they are due to occur… then they just get on with their lives afterwards. How heavy is the bus traffic? Could they get away with something as vague as a bus gate and possibly removal of the bollards plus permission for 2-way cycling? Its not perfect, but the cobbles would probably reduce the cyclists speed and hence the number of “lunatics cycling through at break-neck speed” letters in the local paper. If the cyclists stayed on the cobbles the it reduces conflict with padestrians but if the bus traffic is heavy, it gets dangerous. Wouldn’t a more holistic solution be to divert the buses round the Albion (bus lanes? 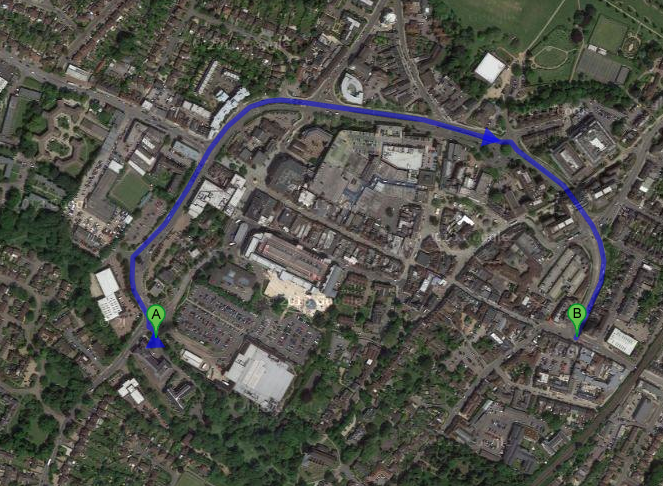 ), close this street to cars (bar access or on a time slot basis) and if needed paint a road for bikes down the middle? Reading (where I live) has similar (but much worse) legacy problems where they built the inner distribution road (IDR) which acts as a horrible polluted choke around the town centre. The centre is largely broad pedestrianised streets that can be cycled with care – much like the suggestion I made above. It seems to work fine but it might be due to the width of the town centre streets. The real problem is penetrating the IDR to get there. This has happened in one location at very high quality but elsewhere you have to behave like a car. Good grief, those bollards. I understand they want to stop people from parking on the pavement, but these hideous unforgiving things aren’t the solution. Every thing you write makes perfect sense to me but it looks like you have a lot to achieve to make this truly bike friendly. You also need to be able to cross the ring roads so you can access the centre. A bike friendly island is only friendly for the bikes on that island. The trick will be to make popping to the shops or centre by bike really easy and that means a quality network as well…. I think you can only explain what needs to happen as you have done here and try to get as much done as possible. One cycle path does not make a network but politicians like isolated projects to brag about. The danger is that one thing as done and that isolated thing has little effect because of the other things that were not done…. so the “we tried but cycling is not in our culture” result is the result. This is all obvious and should be easy as riding a bike, but of course it is not. Your video doesn’t reflect the busy bus movements at peak shopping times when there are often also large vehicles loading and unloading in the bay opposite and even more people stepping into the carriageway. Some widening of the carriageway here (if necessary, narrowing or relocating the loading bay) really does need serious consideration. Two-way traffic on the southern section (Causeway to the Crown) is a real possibility (although there is currently a pinch point at the top of West St) as there is a good turning circle in the Swan Walk access road. This would allow essential loading, disabled access and let cars from the Causeway get back out. A bus bollard (possibly with some additional restricted access for setting up the market etc) would stop non-essential through-traffic. I don’t think two-way working on the northern section is necessary. It would encourage more cars to come in to ‘drop off’, increase traffic congestion on the narrow road and mean vehicles turning in Market Square which would be very disruptive. I prefer just to have just a cycle contraflow here. I think both are tenable. If budget is a limitation, I think contraflow can work. This is St Andrews’ St in Cambridge http://goo.gl/maps/epfyj. It is one-way on a bus route. At the pinch point pictured it is impossible for buses and cyclists going in opposite direction to pass. Both buses and bikes are common. People manage. In practice in normally means the cyclist gets out of the way, because they don’t have much choice. Either hang back until bus has passed, or step onto the pavement until it has gone. When there’s no bus, bikes can pass cars okay. There is no contraflow lane. There’s no room for one. What they have are these: http://www.cyclestreets.net/location/51144/ Which I think are pretty clear. It’s not the most pleasant experience but it’s compounded by the taxi rank pictured. Also there are three bus stops, not one. The Horsham situation looks lovely in comparison! At least the pavement in Horsham is wide if you do need to escape in a hurry. Is such a proposal for Horsham top quality infrastructure? Certainly not. But it’s simple, and cheap, and opens up a legal route which wasn’t there before. If it becomes popular you already have the evidence of use to support something more expensive, like reducing the width of the pavement for a proper cycle lane. The St Andrew’s St is an encouraging example of a successful contraflow in a busy town centre working well without needing a marked lane, so it is useful. 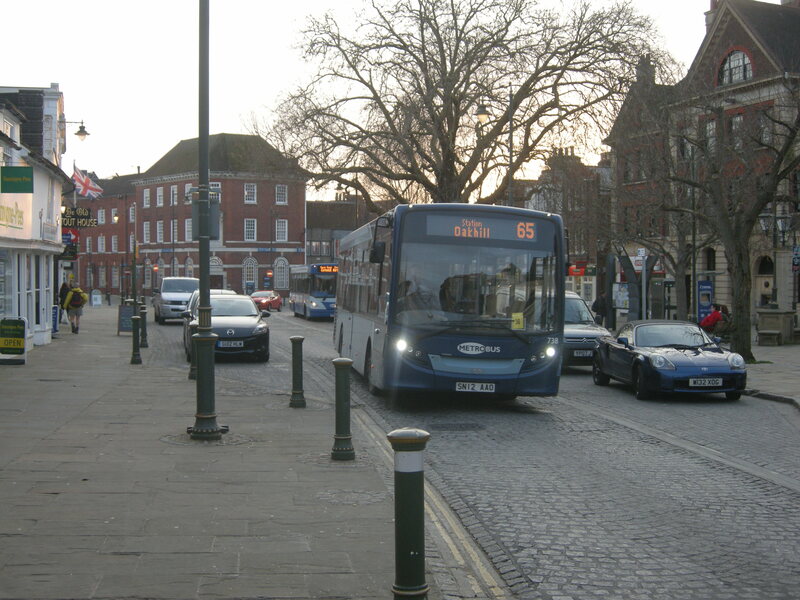 The difference is that, in Horsham, there is a loading bay as well as a bus stop so the ‘contraflow’ cyclist potentially has large vehicles coming out into the road from both sides at once -no pavement to leap onto in that case. Also, the carriageway in Horsham is, I think, narrower and the edge has a gulley too. There is stacks of space to widen it, it’s just that it may be considered too expensive and disruptive to move all the pretty setts and flags and some people won’t want little white bikes painted all over them either! 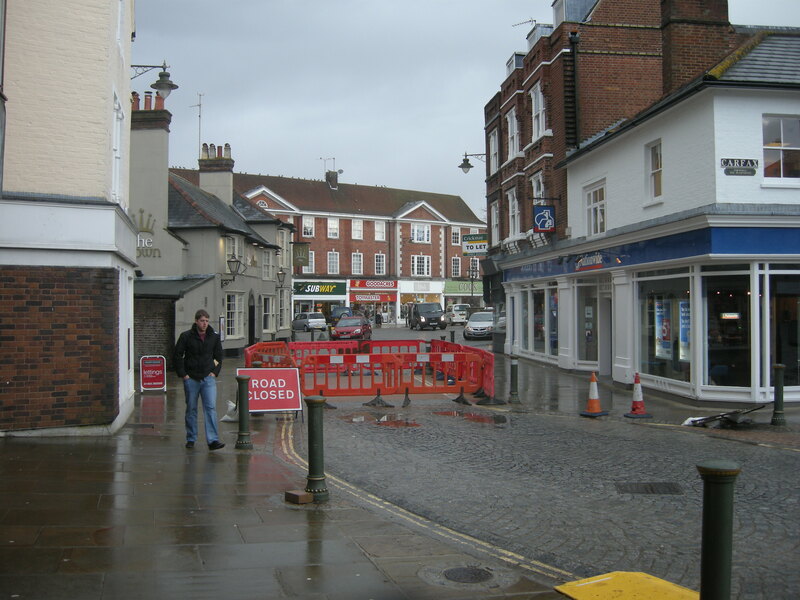 Last time (not long ago) that they mended just three patches of the setts it cost £80,000 and the traffic flow through the town centre had to be diverted for about four weeks. It’s a common mistake but they aren’t cobbles; they are setts, which at least can be ridden, albeit not very comfortable on road bikes. 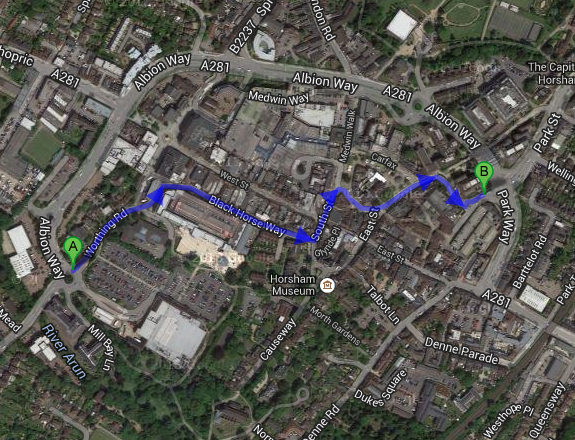 Folk can easily get to the Carfax by bike crossing Albion Way on the “bridge” that is St Marks Court (right past the redundant Church spire) as that route is a public bridleway and it links with the cycle lanes on North Street and thence with Horsham Park where HDC allow cycling. Once over Albion Way by this route you currently have to dismount as highlighted above. The simplest solution is to allow folk cycle on the pavement in the Carfax, if need be installing a shared use cycle lane all the way to the southern edge of the Carfax. Then, if need be a short contraflow cycle lane to link to Middle Street where the existing cycle route network takes over. I think the street map would be more useful than the air photo to seeing what is going on here. You can more easily see which streets within the ring allow cars (more than just that thru route) and which are part of the Fußgängerzone. If you close the thru route, do you want the cars to be turning around at the closure, or maybe there is some way to apply the traffic quadrants idea here, (eg Groningen, Bremen) with only one way streets, in and out, possibly even involving opening up a road to cars that is currently closed, but which doesn’t allow any cross town traffic for cars? not Assen standard but it looks like you’re starting from such a low level in Horsham, a half-way house like this might be easier to sell (plus some bike parking of course). The nasty sets and cobblestones, as well as very high pedestrian flows and lots of routes that are very narrow indeed, make ‘through-route’ cycling through the centre pretty much impossible, or at least deeply unpleasant. 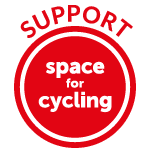 Ideally, I reckon that the council should move towards making as much of the centre shared space as possible (with the exception of very narrow walkways where cycling indeed is dangerous), tons of bike parking, and contraflow cycling generally permitted. There are of course pinch points like in your picture of the bus, but there is often quite wide (and crucially uncurbed) pavement beside that can effectively give a cyclist a way to get round if needs be, as your picture shows. The idea being that people cycling in the centre will mostly be looking to get in, lock up, do their shopping or whatever and then head home the same way they arrived, as directly and conveniently as possible, and would be slowed by the road surfacing and low-speed interaction with cars and pedestrians. This would be quite cheap, needing only some paint and a few dropped curbs, and the council could keep their bloody granite sets. Of course, it would only work if they put in a high-quality segregated route along Albion Way so that these people could actually get home and back, and cyclists getting from A to B could use a direct and safe route instead of cutting through the centre as they do at the moment in a way that is possibly intimidating to pedestrians. And as for the motorway-grade roundabouts that infest the rest of the town….